I call them “my Italian meatballs” simply because I discovered this particular flavour concoction here in Italy and I love it. The addition of grated lemon zest and parmesan cheese to the meat mixture is very different to what I had become used to, of course I have other ways of cooking meatballs but this is the one I make most often. 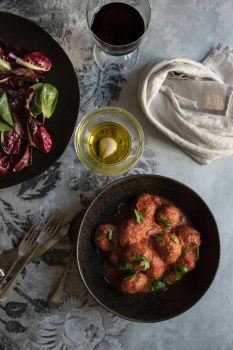 I don’t add garlic to the tomato sauce here (to the sugo), the meatballs have enough flavourings already and there is no need to create a competition and overcrowd the subtle yet distinctive flavours. There is a very handy tip I’ve picked up for the sauce. First put in a pot the olive oil, passata and shallots and bring to the simmer. Once the passata starts to bubble, take the pot off the heat, let the mixture cool for a few minutes and them blend it into a smooth puree. Return it into the pot and cook on a low heat for about twenty minutes. Adjust the seasoning. Now add the meatballs (one by one) into the pot wit the tomato sauce, give it a stir to cover the meatballs with the sauce (be careful not to break them) and cook all together on a low heat with the lid on for a minimum of forty minutes until they are done. Personally I like to make the meatballs a day in advance. Overnight the flavours of the meat and the sauce will permeate and improve significantly. Also they freeze very well in case you make too many at once. Serve them with a potato puree or polenta.